Can we have a light blue line around the world? JAMES Q. WILSON EMAILS: "On August 26, 2007, the Los Angeles Times published an article explaining why the city council of Santa Barbara has been prevented from painting a blue line across the city to mark how high the water will be if you believe Al Gore’s prediction that global warming will make the oceans rise by 23 feet. The idea was not defeated because people realize that Gore’s prediction is silly and wrong, but because a realtor threatened a law suit based on the argument that property values below the line would fall." I think the various organizations promoting concern about global warming should make this a top priority, not only for Santa Barbara, but for the whole world. They are making predictions that would be much more powerful if they were given some concrete form. Remember how impressive the animated aerial views were in An Inconvenient Truth. There are plenty of people who don't know exactly where those lines of elevation are. Many of them have children. It's for the children! Instapundit says, "And don't miss this interview with a female U.S. soldier." What he said. Update: and now it turns out my headline was extra-perceptive in the ironic way: this is one of those war stories that are like some of those fish stories, not exactly true. Which makes this into another journalism post, this one on the subject of (for journalists) checking your sources and publishing a quick retraction if your story was inaccurate, or if you find that your source was deliberately deceiving you; (for readers) not believing everything you read in the papers or on the internet. 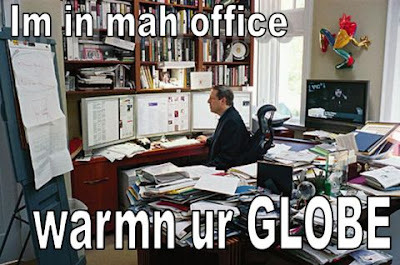 Nice office, Al! Thanks to XWL of Immodest Proposals for the lol macro. It looks better over there, and there's a link to the Tim Blair post that inspired it, so do click on through. An outrageous new falsehood is circulating about President Bush. Last week, New York Times columnist Maureen Dowd misrepresented a Bush statement to imply that he said the Al Qaeda terrorist network is "not a problem anymore," and the distorted quotation has since been repeated by MSNBC "Buchanan and Press" co-host Bill Press, CNN's Miles O'Brien and others, including numerous foreign press outlets. At a time when the New York Times is under fire for its conduct in the Jayson Blair scandal, Dowd's creation of an exploding media myth is cause for serious concern. Busy chasing off Saddam, the president and vice president had told us that Al Qaeda was spent. "Al Qaeda is on the run," President Bush said last week. "That group of terrorists who attacked our country is slowly but surely being decimated... They're not a problem anymore." Al Qaeda is on the run. That group of terrorists who attacked our country is slowly but surely being decimated. Right now, about half of all the top Al Qaeda operatives are either jailed or dead. In either case, they're not a problem anymore. Bush was obviously saying that the Al Qaeda operatives who "are either jailed or dead" are "not a problem anymore," not that Al Qaeda itself is "not a problem." dowdify v: to edit a quote so as to convey a different meaning from what was intended, primarily to damage the subject being quoted. So what would you call the NPR approach to massaging the sound bites to make them smoother? It seems like a form of reverse dowdification, editing a quote so as to convey a more palatable impression than what was actually said, primarily to make the subject being quoted look good, which is still dishonesty or deception. It's a pity: that word ought to mean something like "disguising oneself by wearing one's grandmother's clothes." Can you use it in a sentence? "I think I'll dowdify myself for the school board meeting tonight," said Madonna. NPR news, "fake but accurate"
This requires the Flash Player. Mp3 download here. I have noticed that it's difficult for me to listen to NPR, especially the news; now I think I know why. It's the Velveeta of the airwaves, a sort of extruded processed news product. And in this clip, they admit it! And sound like they are proud of their accomplishments! Too many of our career politicians are senile or otherwise impaired; cleaning up their sound bites leaves something else on the floor beside the uh's and the stumbles, and that's the integrity of the "news" provider. Once you start editing the clips to remove the little infelicities, you have crossed the threshold that George Bernard Shaw was talking about, when he famously, and apocryphally, asked the duchess if she would sleep with him for £10,000. Her response was favorable; he followed up by asking if she would sleep with him for £5. Her response to this was not so favorable: "What kind of woman do you think I am?!" His response to this: "Madam, that is already established. Now we are just haggling over the price." Google searches on Rathergate, fauxtography, "fake but accurate," and Dowdification will yield much to the inquisitive. "Th' newspaper does ivrything f'r us. It runs th' polis foorce an' th' banks, commands th' milishy, controls th' ligislachure, baptizes th' young, marries th' foolish, comforts th' afflicted, afflicts th' comfortable, buries th' dead an' roasts thim aftherward." he was pointing out overreaching by newspapers and the writers thereof, not suggesting things that they should be doing. Further explication by Dr. Ink at Poynter. Update: and see Trooper York's joke about comfort food. Ape Lad reveals the hitherto little-known beginnings of the burgeoning LOLcats phenomenon. Not many people know this, but my great grandfather Aloysius "Gorilla" Koford, was also a cartoonist (see the video evidence here). From 1912-1913 he produced a comic strip which was featured in 17 newspapers, including the Philadephia Star-Democrat, the Tampa Telegraph, and the Santa Fe Good-Newser. The strip was entitled "the Laugh-Out-Loud Cats" and featured the exploits of one Meowlin Q. Kitteh (a sort of cat hobo-raconteur) and his young hapless kitten friend, Pip. The strip did not last long due to a run-in my great-grandfather had with none other than William Randolph Hearst. 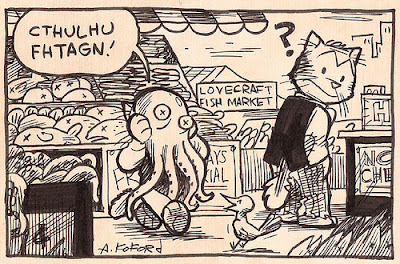 showing that Lovecraft was, indeed, more of a chronicler than a fabulist. Nothing to do with global warming, either. Just for laughs, I tried a Technorati search on "Rain in the Doorway," and much to my surprise, came up with this: this is the story of the girl who could drink only tears. Where's the percentage in wishful thinking? That's the beginning of a poem by the blogger at Nothing But Clear Air. Go read the rest, for it is good. That's Alex Foley, if that's his real name. He likes Larkin, Auden and Blake, so that's good. He does not post often, and many of those are quotes, but I will visit this site again to look for more new pieces. Now I need to add a new label, "poetry." Well, all right then. Perhaps we'll have more poetry here, along with the warming and the squids. Back in 1975, global cooling was going to lead to massive starvation due to crop failures, and so on, and so on. Do click through to Extreme Mortman for this scan of the article from Newsweek. Note particularly the conclusion: "The longer the planners delay, the more difficult will they find it to cope with climatic change once the results become grim reality." Sounds oddly familiar. Planners need tax money, though, and plenty of power. (Not electrical power, so much, but political power.) They did not get those things in '75, and now we have warming. Oh, darn! If only we had melted the polar icecaps back then, as the scientists were calling for! You'll probably need to click that to make it legible. Update: Thanks to Jerry Pournelle, I see that Dennis Dutton has typed out the text and posted it. There was a global cooling consensus among scientists, at least up to 1974. And it went on to appear in Newsweek, The Washington Post, The New York Times and many more media outlets around the world, at least up to 1976. Often backed up by the Red Army Choir and Band. Sweet Home Alabama. Smoke On the Water. Happy Together. You're My Heart You're My Soul. Those Were the Days. Freeman Dyson on scientific attitudes toward "global warming"
We keep hearing the warmingists talk about consensus, and how everybody they know agrees with their position, and that this proves that it must be so. That's not science. Jerry Pournelle would like to draw your attention to this essay in which the noted physicist and astronomer Freeman Dyson discusses consensus and heresy in science, using the current controversy over AGW as an armature to hold the argument. Read the whole thing. Photos by George Dyson and others from the recent SciFoo convention following the essay. Most major companies refer to a detailed code of corporate conduct when considering such policy decisions. General Electric devotes 15 pages on its Web site to an integrity policy. Nortel's site has 34 pages of guidelines. Google's code of conduct can be boiled down to a mere three words: Don't be evil. Google Video robs customers of the videos they "own"
Samuel sez, "Hey guys. Several months ago, I bought an episode of Star Trek on Google Video, just out of curiosity to see how it worked. Today I got an email letting me know my videos would stop working in five days." If you "own" any of these videos, take a look, and follow the link at the bottom to Google Video DRM: Why is Hollywood more important than customers? They tell us that downloaded video is the wave of the future. DRM is the dead hand of the past. (I see a hand, waving me on; but it's a dead hand on a stick, held by a predator, luring me into ambush! Yikes, I better stop now. "When mixed metaphors go bad.") Seriously though, the whole computer/software business has been troubled by ridiculous, barely-legal EULAs and things like the the DMCA for all its short life. Downloadable video that expires? Bad, but par for the course. An important post at Warren Meyer's Coyote Blog: Breaking News: Recent US Temperature Numbers Revised Downwards Today. Just go read the whole thing. It seems a little Y2K bug got into NASA's (already suspect) numbers. Reminds me of this. Thanks to BoingBoing, where you'll find a link to more of this Channel 5 series of Paul Merton's travels in China. Mark Steyn on "Alms for Jihad"
Or, how to suppress a book thoroughly, but quietly. The removal from libraries makes it even more thorough, and horrifying. Even books that have been thoroughly discredited, such as Michael Bellesiles's Arming America, are allowed to remain in libraries. My local system has a copy of Clifford Irving's hoax Autobiography of Howard Hughes! How will we lose the war against "radical Islam"? Well, it won't be in a tank battle. Or in the Sunni Triangle or the caves of Bora Bora. It won't be because terrorists fly three jets into the Oval Office, Buckingham Palace and the Basilica of St Peter's on the same Tuesday morning. The war will be lost incrementally because we are unable to reverse the ongoing radicalization of Muslim populations in South Asia, Indonesia, the Balkans, Western Europe and, yes, North America. And who's behind that radicalization? Who funds the mosques and Islamic centers that in the past 30 years have set up shop on just about every Main Street around the planet? For the answer, let us turn to a fascinating book called "Alms for Jihad: Charity And Terrorism in the Islamic World," by J. Millard Burr, a former USAID relief coordinator, and the scholar Robert O Collins. Can't find it in your local Barnes & Noble? Never mind, let's go to Amazon. Everything's available there. And sure enough, you'll come through to the "Alms for Jihad" page and find a smattering of approving reviews from respectably torpid publications: "The most comprehensive look at the web of Islamic charities that have financed conflicts all around the world," according to Canada's Globe And Mail, which is like the New York Times but without the jokes. Unfortunately, if you then try to buy "Alms for Jihad," you discover that the book is "Currently unavailable. We don't know when or if this item will be back in stock." Hang on, it was only published last year. At Amazon, items are either shipped within 24 hours or, if a little more specialized, within four to six weeks, but not many books from 2006 are entirely unavailable with no restock in sight. Well, let us cross the ocean, thousands of miles from the Amazon warehouse, to the High Court in London. Last week, the Cambridge University Press agreed to recall all unsold copies of "Alms for Jihad" and pulp them. In addition, it has asked hundreds of libraries around the world to remove the volume from their shelves. Read the whole thing. Stanley Kurtz has more at The Corner. More updates at Hot Air and Michelle Malkin. Andrea Harris, inspired by that Mark Steyn piece, has a plan that sounds a lot like FDR's tactics for the home front: more serious than what we have now. And high time, too. Discussions of Kyoto, warming, environmental anything without taking the Asian Brown Cloud into account are just hot air. Though Achim Steiner of the UN manages to emit some gas in the first sentence of the last paragraph. Spotted in Jerry Pournelle's mail. Bridge collapses in Minnesota: blame Bush! It's true. Harry Reid agrees. Everything is George Bush's fault! It's self-evident. No-one in Minnesota had anything to do with this. No construction contractors were careless with their jackhammers, no inspectors signed off too readily on the condition of the overpass. Even the Rolling Stone can see through fuel ethanol as currently practiced in the US: Ethanol Scam: Ethanol Hurts the Environment And Is One of America's Biggest Political Boondoggles. That title sums it up. Specifics in the article.